Anyone who adores French Country Design is familiar with the world’s most famous and beloved French Country Designer, the late Mr. Charles Faudree. I never had the privilege of knowing him, but have spent countless hours poring over the pages of his beautiful books studying every detail of his breathtaking designs. Each room possessed a timeless charm with a beautiful mix of fabrics and colors and special treasures displayed as accessories. Every detail played upon the other creating the most flawless look. Living spaces were made to appear warm and inviting while maintaining a sense of beauty and elegance. For a girl, who is a true sentimentalist to a fault, his designs just spoke to me and still do. Last week, I received an advertisement from Estate Sales by Allen in Tulsa, Oklahoma. It advertised a warehouse estate sale containing some of Mr. Charles Faudree’s personal items. As I was looking through the sale pictures, I noticed a beautiful French pastry table. Oh, how I have been wanting one for a long time, let alone one that was in the home of the legendary Mr. Charles Faudree. I called my husband and told him about the sale. He told me that he would buy me the table as an early birthday present. I said, “That is crazy! There is no way that you are going leave this house early in the morning and drive two hours for a table.” He said, “I am determined, and you are going to have that French pastry table.” Being a man on a mission, the next morning, he left the house at 4:00 am and made it to Tulsa by 6:00 am. Lo and behold, he was the first person in line. He stood in line for four hours so that I would have that French Pastry Table. That is true love, most definitely true love. While my husband was at the sale, as an extra surprise, he purchased a beautiful rooster lamp that was also in Charles’ home. He also visited with the delightful owner of the estate sale, Mr. Allen Hynes. He told my husband that he knew Charles for many years. He spoke of Mr. Faudree in the fondest manner. You see, Charles was not only a talented designer, but a kind, thoughtful, and giving man. He was well known for his charitable work in the Tulsa community. For several years, I have admired Mr. Charles Faudree’s beautiful works from afar. I am just a girl from a small town in Oklahoma. I am beyond belief that I own two items from his personal collection. I only hope that, in my home, I will do his beautiful things justice. I will always treasure these items not only because they belonged to my favorite designer, but also because they came from the love of my life, my husband. I am truly a blessed girl. I placed my French pastry table in the breakfast area of the kitchen. This is a close up of the iron and brass workings that make up the base of the table. The top of the table is white marble. This is the beautiful rooster lamp. I love the colors and gorgeous lampshade. I arranged some of my blue and white plates around an “aged” looking mirror that I already had in the area. Thanks so much for stopping by. I’m so glad that I was able to share this special story with you. I hope that you have a blessed Monday. Beautiful, absolutely beautiful! You are one lucky girl. I would love to be first in line if you ever sell that adorable lamp! Thank you for the sweet comments Missy. I am so glad that you stopped by, and I hope that you have a great day!!! Rhonda, he is a super guy, and I am so blessed to have him. Thanks so much for your sweet comments, and I am so glad that you stopped by. I hope that you have a wonderful day!!! What fabulous treasures! I understand your excitement. Thank you Connie! I still can’t believe it! Thanks for stopping by, and I hope that you have a great day!!! What a blessed lady you are to have such a loving husband. The table and lamp are beautiful and you have learned well from your study of the great Mr. Faudree. He would be so proud. You have done a beautiful job in the use of these new cherished pieces. As a fellow Oklahoman and fairly new reader, I have admired what you have done to your beautiful home and look forward to continuing to follow your blog. Kathy, you are too kind! Thank you so much for your very sweet and gracious comments. They made my day! I’m so glad that you stopped by, and it is so nice to meet a fellow Oklahoman. I’m new to the blogging adventure, but have been blessed to meet so many kind people. I hope that you have a great week!!! Thank you so much Donnamae! I am still in shock!!! I hope that you have a wonderful day!!! How fortunate for you! That is quite a story and I am so happy for you. Not everyone has that history behind a piece, that makes it that more special. It’s wonderful that it was sold to someone that will always treasure it. You did a wonderful job styling it. Thank you for your very kind and gracious comments Jan. I’m so glad that you stopped by and that I was able to share my story with you. I honestly can’t believe it! It is definitely something that I will treasure forever. I hope that you have a wonderful week!!! Wow!! !….Your hubby gets husband of the year. That table is magnificent! You should consider writing down the story of how you got the table, place it in an envelope and tape to the bottom of the table….that way it can be passed down with the story for generations!….Love the lamp too!…Enjoy your treasures! Thank you so much Shirley. I will be sure and tell my husband what you said. Thanks for that great tip. I’m going to be sure and do that. That is a wonderful idea! Shannon, this is the sweetest story! You are fortunate to have two pieces of Charles Faudree’s estate in your home, but the real treasure is that man you married! He is a sweetheart! His actions speak volumes about who he is and how he adores you. I’m so happy that you have these in your home, not only are both beautiful and functional, but they have incredible history. I would have loved to have attended that sale. What an opportunity. Thank you for sharing your story. Sarah, my husband read your kind words. I know that I am very blessed to be married to such a wonderful man. I’m so glad that I was able to share this story with you. Thanks so much for stopping by, and thanks again for your very sweet comments. I hope that you have a great rest of your week!!! I love that table and the way you have it styled walls and all. Perfectly adorable………….. Thank you so much for the very kind comments Nellie. I’m so glad that you liked it! I hope that you have a wonderful day!!! Wow! What a Hubby!! True love to drive that far, stand in line and buy not just the table but the lamp too! Pretty darn special! It looks lovely and I know you will treasure it forever. Thank you Nancy. I know I am a very blessed person. I’m so glad that you stopped by and that I was able to share this story with you. I hope that you a wonderful day!!! What a sweet guy you are married to! I love how he went out of his way to bless you for your birthday! That is something my hubby would do for me too. Your vignette is gorgeous! The table is a fab piece and I am swooning over the rooster lamp! Love your arrangement of blue and white plates. Well done and thanks for sharing with us. Sandi, I am so glad that you stopped by and that I was able to share my story with you. Thank you so much for the very kind comments. I hope that you have a blessed day! Oh, what a lovely story to share with us all! How very special to have a French pastry table that once belong to the beloved Charles Faudree. And of course, it looks fabulous! Thank you so much Angelina! I’m so glad that I was able to share my story with you. I still can’t believe it. I hope that you have a wonderful day!!! That is the best story, Shannon!! We lived in Edmond for 23 years and I always wanted to go hunt down Mr. Faudree. You are so lucky to have those things. Thank you Stacey! I’m so glad that you stopped by and that I was able to share my story with you. It is also great to meet a fellow Oklahoman. I hope that you have a wonderful day!!! Thank you so much Janice. I know what you mean about the rooster lamps being expensive. Maybe you will find one soon. I’m so glad that you stopped by and that I was able to share my story with you. I hope that you have a great rest of your week and a wonderful weekend!!! “Ditto” on all the previous comments! And I’d like to add that I really think Mr. Faudree would approve of the way you’re using his former treasures. I’m sure you’ll always enjoy them! Thank you so much Martha, especially for the gracious comment regarding Mr. Faudree’s approval. I’m so glad that I was able to share this story with you. Have a great rest of your week and a wonderful weekend!!! Honey, you better tie that man down and do NOT let him go!!! LOL! He is a winner for sure! We have been married for 48 years and I know my husband loves me but there is no way he would have done this!!! I adore your table and the lamp, what TREASURES to have!!! Love Shirleys idea of taping the story to the table too!!! Pinky, I know I’m a blessed woman to have such a wonderful husband. I’m so glad that I was able to share this story with you. I loved Shirley’s idea and have already done it. Thanks so much for stopping by, and I hope that you have a wonderful weekend!!! Lucky girl! I love the pastry table and the wonderful rooster. Blue and white with yellow — some of my favorite color combinations. I really love them for summer. Have a great weekend! Thank you so much Snap! I hope that you have a wonderful weekend too!!! Your husband is the most thoughtful, kindest man to do that. How thrilling to own not one but two items owned by Charles Faudree. To me, it is like going backstage to see a singer or actor. But better since you get to see it every day. The way you styled it looks wonderful. Debra, I feel the same way you do. I am still in disbelief! I’m so glad that I got to share my story with you. I will be sure and tell my husband what you said. He is truly a very thoughtful and kind person. I hope that you have a wonderful weekend! You must be living right! Both pieces would be beautiful anyway, but to know they were Charles Faudree’s…. Jealous. Jealous. Jealous. Eilis, I’m glad I was able to share my story with you. I read you blog this morning, and am sending you lots of good thoughts for a speedy recovery. I know it is so tough to be on bed rest. I will try to find something to post on your party. Take care. Thank you so much Lisa! I’m so glad that you stopped by, and I hope that you have a great rest of your weekend!!! 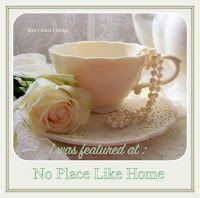 I am featuring your lovely post this week at my No Place Like Home party. Hope you have a wonderful week. Sandi, you have made my day!!! Thanks so much for featuring my post, and thanks for hosting the party. I love reading all the great posts!!! I hope that you have a great Monday!!! I love the blue and white plates as well as the pop of colour from the lemons! Thank you so much Lauren for the sweet comments. I’m so glad that you stopped by, and I hope that you have a wonderful week!!! Hi Shannon, my name is Anne and I’m a first time visitor to your blog (by way of Amaze Me Monday). This table is amazing, I love the lines and the mix of materials. And you’ve created such a sweet and timeless vignette! Anyway, have a great day, and hope to see you stop by my blog sometime to say hi! Hi Anne! I’m so glad that you stopped by, and I will stop by and visit your blog. Thanks so much for your very kind comments. I hope that you have a wonderful week!!! What a score! Your sweet husband might have found himself a side gig! I”m so glad you got the table . You’ve styled it perfectly and I know you must be thrilled! Thank you so much Lisa! I’m beyond belief every time I look at it. I’m so glad that I was able to share my story with you. I hope that you have a wonderful day!!! How lucky and loved you are. Wish I’d have know about the sale. I’d have driven to Tulsa in a heartbeat. Thank you, Jennifer, for the sweet comment! I do treasure that table so, and feel very fortunate to have it. I am so happy that you stopped by for a visit! I hope that you are having a wonderful week! Hi Kathy! Thank you for your very kind comment. I do so treasure my table and lamp and the sweet man that bought them for me. I have always adored the work of Mr. Faudree. His style was not only beautiful but timeless. I am so happy that you stopped by for a visit, and I hope that you enjoy the rest of your week!! !